Food lovers rejoice! 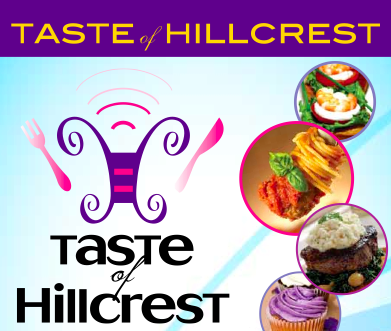 Over 30 of the most irresistible restaurants in Hillcrest are taking part in one of tastiest event of the Spring season - the Taste of Hillcrest will take place on Saturday, April 20, 2013 from noon to 4 p.m. Once again, the Taste of Hillcrest is a self-guided adventure of culinary cuisines from all over the world including Asian delights, all-American favorites, delicious Italian fare, and so much more, all combined with frosty samples from San Diego's finest craft breweries. As you start your culinary journey, your senses will be transported to Asia where Bombay Exotic Cuisine of India has some savory samosas waiting to greet you. Their popular crispy pea and potato stuffed pastries, seasoned with exotic spices and lightly fried are sure to start your experience off right. Travel your way to Greece as Daphne’s Greek Café will be offering zesty street pitas filled with fresh roma tomatoes, crisp lettuce, red onion, fresh-carved gyros, with their cool classic Greek yogurt. Then take your taste buds on a trip to fabulous Mexico, as Fiesta Cantina will be serving up their mouth-watering Santa Monica Rolls. Their warm, crispy flour tortillas filled with succulent chicken, black beans, jalepenos, melty cheese, and fresh pico de gallo will have your stomach saying “muchos gracias!” Make your way back to the states as you savor Brazen BBQ Smokehouse’s juicy pulled pork, served on a wonton chip with smoked ancho-chili cashews, it is a terrific twist on an American favorite! The fun doesn’t stop there, as this year we are proud to also be featuring some of San Diego’s leading micro breweries! Grab an ice cold frosty beer, from breweries like Aztec Brewing Company, Firestone Walker Brewery Co., Manzanita Brewing Company, Stone Brewing Company and Thorn Street Brewery to pair with perfectly with the delectable dishes you’ll be enjoying all afternoon! As you are enjoy the refreshing brews, make sure to pursue the retail locations for amazing shopping deals! Find unique gifts at Cody's Home & Gifts and treats for your four-legged friends at The Pet Lounge. Just when you think your stomach (and your pants) have reached its limit, be sure to make just that extra bit of room for some decadent desserts, like gourmet chocolate-dipped Granny Smith apple wedges from Edible Arrangements, and tummy warming specialty coffees from Café Barbera. Afterward, you can walk off your food coma or jump on to one of the complimentary shuttles to make your way around town! 5. The Pet Lounge, Inc.
2. Firestone Walker Brewery Co.
Tickets to the 13th Annual Taste of Hillcrest are just $30.00 in advance and $35.00 on the day of the event with proceeds benefit the Hillcrest Business Association. To purchase tickets now or check out a complete list of participating restaurants, retail locations or breweries please visit FabulousHillcrest.com or call 619.233.5008. Tickets are limited and have sold out in advance for the last nine years, so purchase them soon to secure your ticket to this ultimate “taste”. Your taste buds will thank you later!